When a dear friend passed away the beginning of the year, I was delighted to be asked by the family, to keep her memory alive. They wanted her favorite sweater to be made into a Christmas quilt. Mary had a Christmas sweater that she wore every year. Noah's Ark at the Holidays. All the animals 2 by 2. When I was given the sweater, I wasn't sure what to do. You know how they say, your fabric will speak to you? When I found it, it became quite clear. I carefully went to cutting out the appliques, from the sweater. After careful consideration, I chose to leave the sweater behind the appliques. any sweater pieces from coming thru. I just love how the appliques seem to float on top of the quilt. 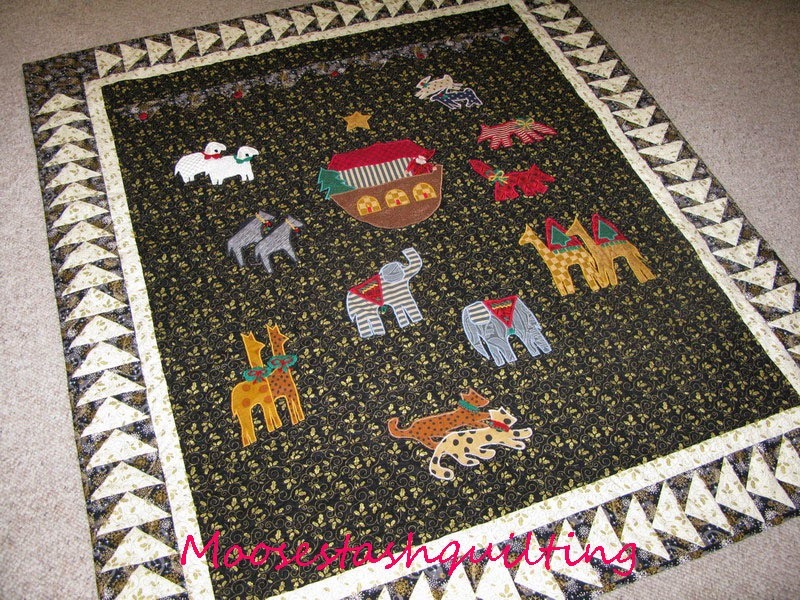 was a perfect way to be able to add the buttons into the quilt. Thanksgiving is all about giving thanks, for everything in our lives. Mary, I'm so thankful to have been able to be a small part of your life. You always made everyone, feel like family. You are missed each and every day. But your spirit lives in us all. one of your family, at the holidays! Oh those memories, we all share. 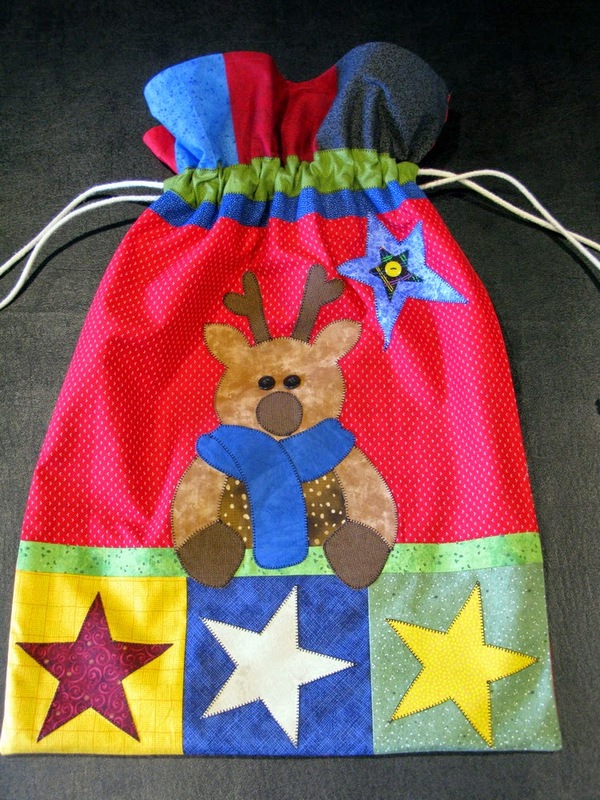 I shared with you this "Easy Santa Sack" pattern from The Red Boot Quilt Company the other day. A whopping 18" x 26" size. Perfect for those Christmas gifts. A face every reindeer would love! It might still be in the $4 Friday bin! Also, I told you yesterday that the "Ugly Christmas Sweater" pattern over at "The Applique Garden" (it's linked for you) had my name on it. Well, imagine my delight when I downloaded this block. You know it was met to be!!!! LOL! That's my story and I' stickin to it! The blocks are 15" each. They are fast, fun and easy. There is still plenty of time before Christmas. I know my family is going to get a kick out of this! I'm going back to stitchin! ...did I expect to see this. You see, it was a typical morning... I sat down with my coffee to read my emails. 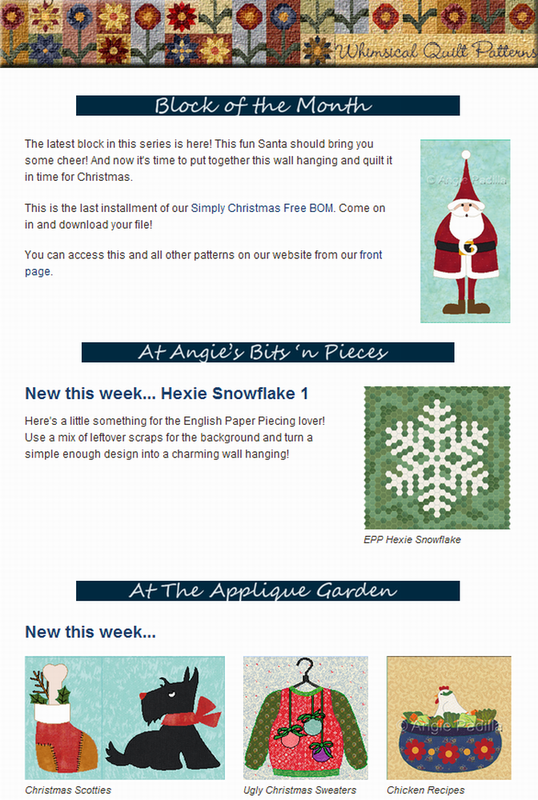 Angie's Bits and Pieces sends out a newsletter each week. The weeks worth of her adorable design updates. But this week was different. It's cause I'm an addict. other addictions I could battle. Not counting the Chocolate one, of course! But prolific...I had to laugh. My quiltin sista calls me that all the time! I really don't know what to say, but Thank you Angie. You tickled me from head to toe! You can see the newsletter for yourself right HERE. While your checking, sign up to get a copy, weekly for yourselves. Who knows what inspiration you'll find! 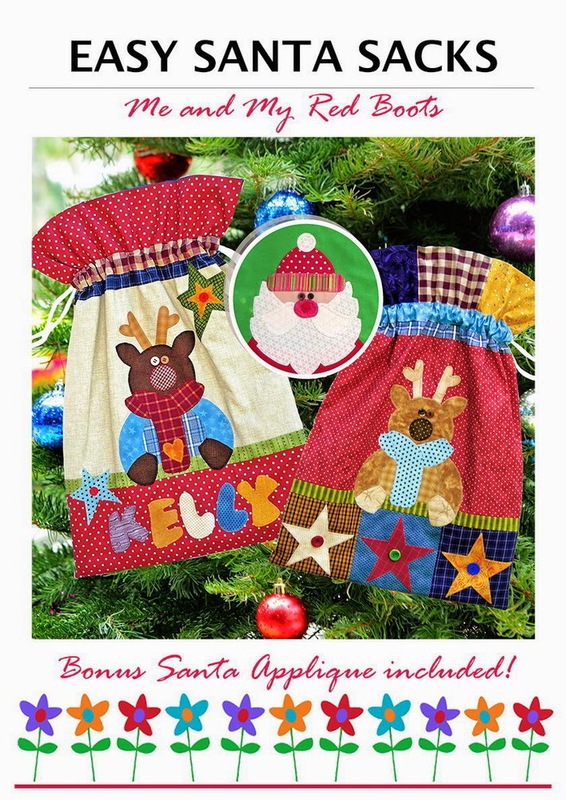 There's an Ugly Christmas Sweater design in the Applique Garden that's calling my name! Today I got a newsletter from "Me and My Red Boots", about a new tax...EU VAT Digital Tax laws. I can feel my eyes glaze over when I read about new taxes! While she suggested that we Google it and see just what will happen to small businesses, I have not done so yet. Instead I went shopping! 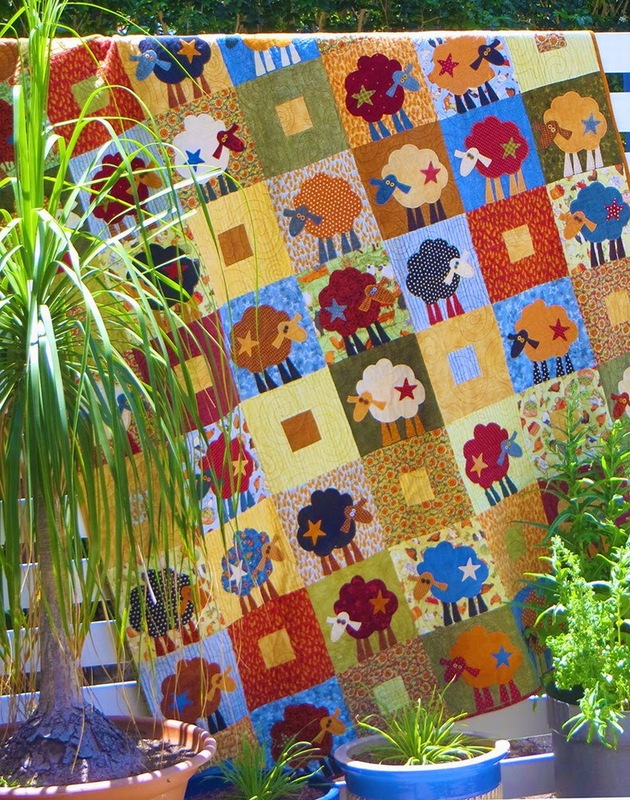 :-) For today only she is offering her "Scrap Bin Sheep" digital download for just $4. It's only good for 24 hours, so you have to hurry! 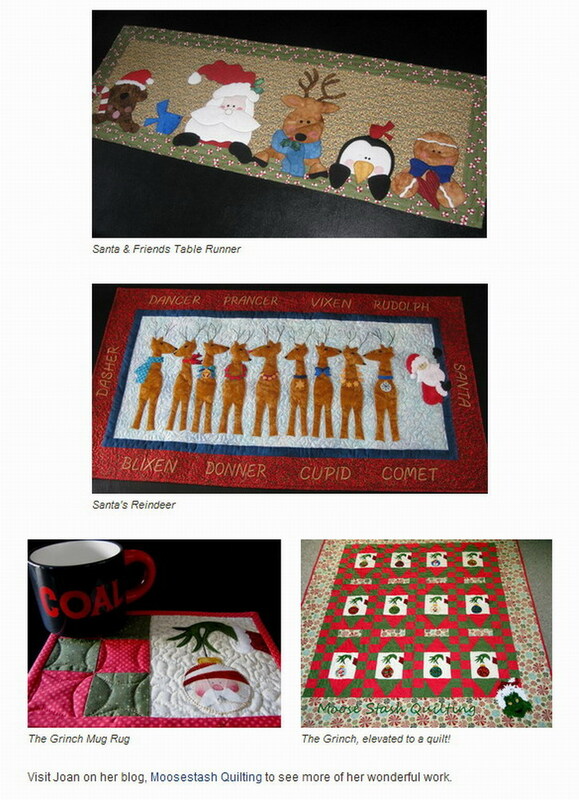 If you are not familiar with Red Boot, she offers $4 patterns every Friday. it was still up for the $4 also. You might want to take advantage while you can! Oh the temptations, I know! 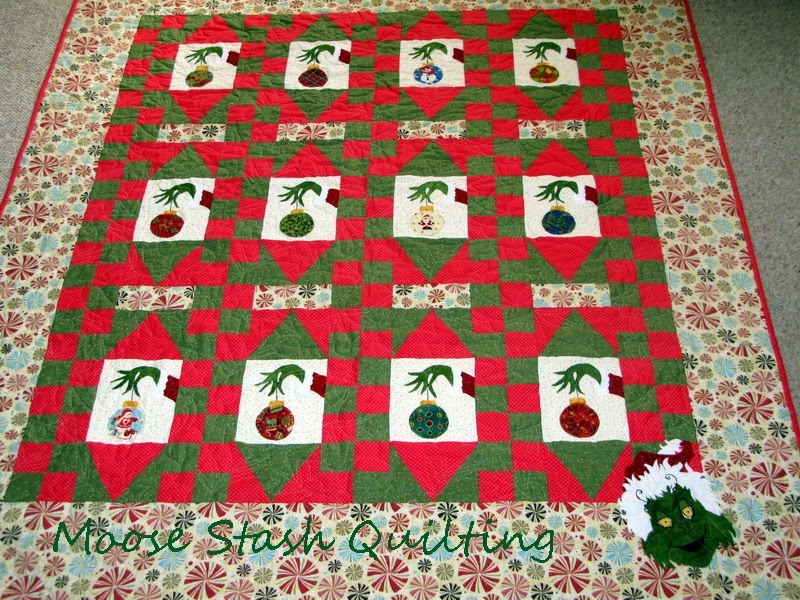 I so appreciated all the wonderful comments that were made about my Grinch quilt! When I stumbled on this, on Facebook, I knew I just had to share! I'm open to any and all bribes! With the help of none other, let me announce my give a way winner. Charlotte, I've send you an email for your mailing info. out of your day to visit! 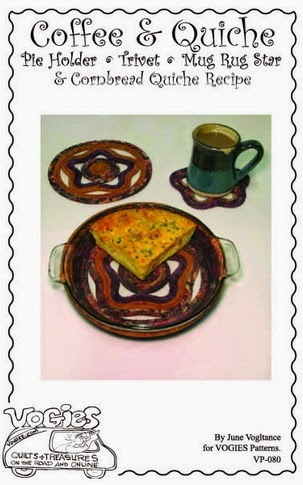 I've received some emails this week asking about the Pie Plate trivet I mailed to Deonn. but finally it turned up in a pile of "must do" projects. I'm sure some of you know just what I mean! You can find it right HERE at Vogies! It's very easy to do. Some clothesline, a glue stick and fabric strips. On that note...I have found that the clothesline that Wal-Mart sells is wonderful to work it. that the line that is marketed for bowl making! Once again, I can't thank all of you enough. Your support, inspiration and sweet comments, just keep me coming back for more! Wishing you all the best in the holiday season! Can you just picture this with a moose in hand??????? Here is a quick little tutorial to create one of these marvelous rice bags. but please read all the directions before you start. I started out with a piece of paper 12" tall and 16" wide. I folded it in half and marked a neckline, approximately 6 1/2" wide by 5 1/2" deep. I just "winged" it when it came to rounding the neckline, but on the outside edges I traced around a coffee cup. Here is a photo of my pattern on a cutting mat, so you can get a general idea of the measurements. and laid it in between my outside fabrics. You want the right sides facing up on the top and down on the mat. Pin together and cut all 4 layers at once. With the muslin already inside, you won't have to move the fabrics in your stack. Remove your pattern piece, and pin all the way around the outside edges of your bag. This will keep things from shifting as you stitch. Once your all pinned, you will want to mark your first stitching line about 1/4+ below the lowest point of your neckline. You can see a faint white mark in the photo above. I used a chalk marker. Stitch from side to side making sure you back tack each end. From there, you are going to want to work your way up from that line, stitching rows approximately 1 1/2" apart. You can remove the pins as you go. It's easy to keep your lines straight, as the ruler lines up with the straight sides. I stitch a row then draw another line, then stitch a row, draw another line, etc etc. Once you have worked your way up to the top, you start working your way down. Same 1 1/2" rows. Before we can fill these rows with rice, we need to stitch a line around the top (I've put a pin so you can see approximately where to start and stop) You want to give yourself enough room to insert a funnel tip when filling with rice. Stitch right around the top, from one shoulder, around the neck and to the other shoulder. At this point I fill each of the top tubes with rice...nothing fancy, just what's in your cupboard. Stitch the top of each tube closed, as you go. Word to the wise...you are going to want to leave at least 2-2 1/2" room at the top of each tube, or you will never get the binding stitched on later! Once both shoulders are filled and stitched you can stitch down one side, and across the bottom coming up the side a bit just like we did on the top. Fill all your rows, stitching each one closed as you go. Your almost there. For this, you are going to need biased binding. We have a lot of curves to go around. I cut mine, 2 1/2" wide, pressed it in half wrong sides together, and attach like I would any quilt, but since we have the bulk of rice, I suggest starting with a 45% angle and press under a 1/4", like shown below. I've had to re-enact this, so please bear with me. I used some scrap to show you. Don't let it confuse you. We are binding the actual bag filled with rice, not what was cut away. Stitch down the bottom half of the binding, then leave open a little (as shown above). This will allow for tucking the opposite end in, once the binding is all stitched in place. Stitch around the entire piece with a 1/4" seam allowance. Then tuck in the tail and stitch in place. This is what it will look like when your done. You can whip stitch the ends together along the seam. Fold over and hand finish your binding. Take your time in stitching the binding. You will have to start and stop, taking it out of your machine and shaking the rice to different places at times. I learned the hard way, the joys of over filling. I also experimented with running a basting stitch about 5/8" in, before filling with rice. After machine stitching on the binding you can remove that basting row before you hand stitch it down. It actually worked out pretty well. Your all done. Pop that little guy into the microwave for 1 minutes then sit back and enjoy! On that note...my youngest asked me to make him one to replace his tube sock full of rice. Now that's a picture in my mind I'm not sure I want to see! One for "the boy" and one to go into someones Christmas stocking! I have tried to cover things the best I could. If you find you have problems or spot errors, please do not hesitate to contact me. Oh but one smart Samm, came up with a way to make it all happen! With help from a very special little "ELF" Marlene, we are going to have a few extra moments this holiday to sit back and enjoy! Thanks you two, for all you do! I received my package from Brandy over at Pampered Pettit. Is it with this adorable little bag, with quilting peeking thru that just makes you smile? Lets face it...would be absolutely perfect for anyone. Makeup bag, child's toy bag or pencil case, a project tote for quilt class. Best yet it's personalized. Is that the greatest? I know I'm going to be busy, making up these little treasures for my quilting buddies. Is it this delightful toffee? but that just isn't happening! I have no idea where they all went. They were on the plate, then they weren't. Could it be that I ate them all!!!! I contacted Brandy, and she is willing to share the recipe for this yummy toffee! And I might add that yummy just doesn't do it justice. It's wicked good. Heat oven to 400 degrees. Line a jellyroll pan with foil, spray with non-stick cooking spray or grease with butter. Cover with crackers (~40). In a sauce pan bring to a boil for 3 minutes the butter and brown sugar. Pour over crackers and bake for 5 minutes. Remove from oven, you may need to spread the toffee over the crackers more evenly at this point. Turn oven off. Let cool 5 minutes. Sprinkle chocolate chips over crackers, place back in oven for 2 minutes, or until chocolate is softened. Remove from oven and spread chocolate evenly over crackers. Cool in fridge or let set overnight to harden. She even shared the link for the free pattern for the little tote bag. This little card just about says it all, doesn't it? Thank you so much Brandy. What a great package to receive! 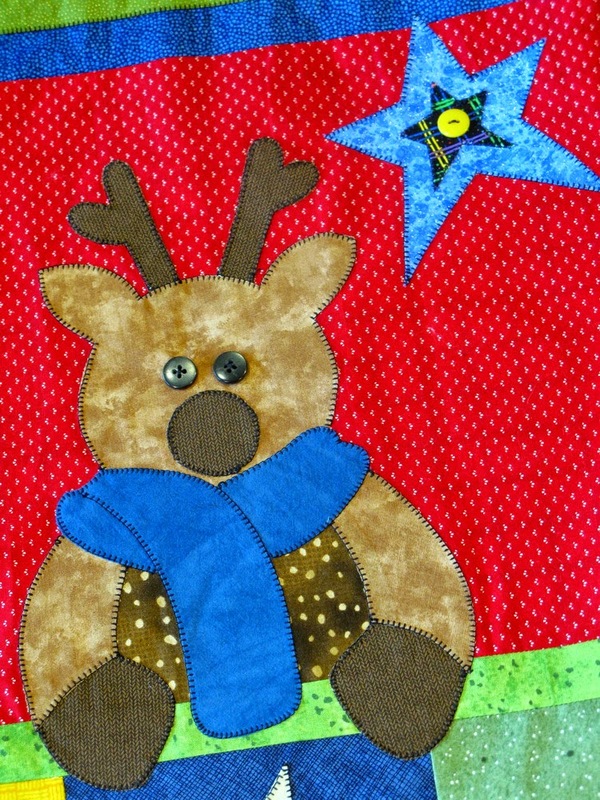 This little mug rug was from Angie's Bits and Pieces Christmas in July patterns. I talk about Angie all the time here. She has the cutest darn designs! Some how I fell off the wagon of quick gifts! 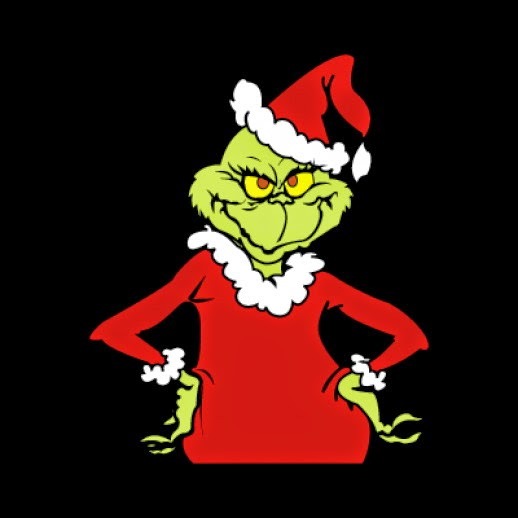 You see the Grinch is one of my favorite holiday characters. As I was stitching up the mug rug, I have visions running thru my head, but they were not sugar plums! Oh no, not at all. 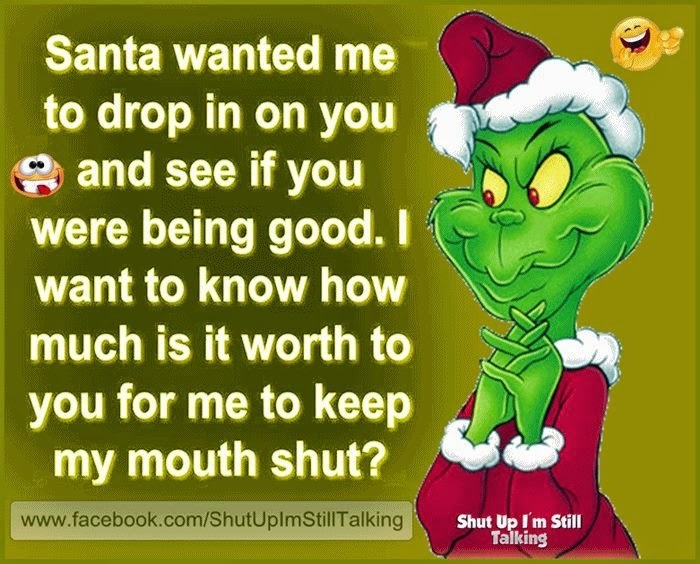 They were much more Grinchy than that! After all, if he can steal one ornament, then why not 12 more? 12 little mug rugs stitched in a row, to make one big quiltie to warm toes below! OK, so I'm no poet! An online search for coloring pages, found find this handsome guy! Just what my quilt needed. I finally reeled myself in, and did a few more quick gifts. I love these fabric key chains. They are so easy to find in my purse. Thanks to The Idea Room. These hand sanitizer holders, are just perfect for this time of the year. Elastic, that buttons onto anything, makes them so versatile. You can find the tutorial for these HERE. Thanks to The Inspired Wren. I recently saw these "over the shoulder" rice bags. I rushed right home to draft one up, for myself. I just can't tell you how wonderful these feel when they come out of the microwave. Oh so soothing on your neck and shoulders. It's wonderful to wear when your stitching too! Tomorrow, I will post a little tutorial for you, so you can make your very own. And trust me, you are going to want one! 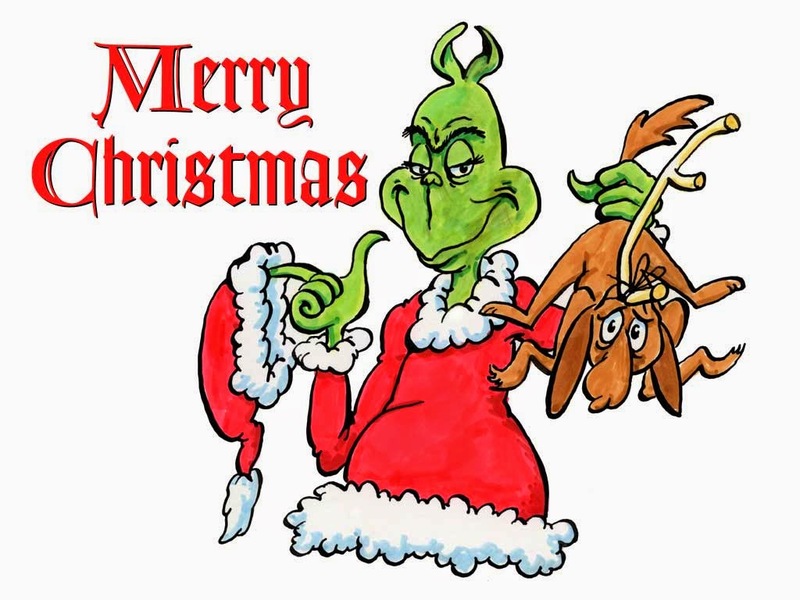 Leave me a comment telling me about your best Grinchy memories, and you just might be the winner of my Grinch mug rug! (cup not included) It just won't fold up and fit into an envelope, but who knows what other surprises might! I will pick my winner on Nov 21st. The last day of the hop. 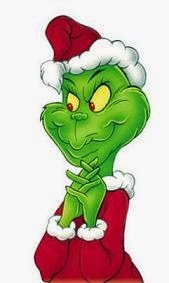 Till then I will be watching for all your great gift ideas. everyone open up their gifts online!